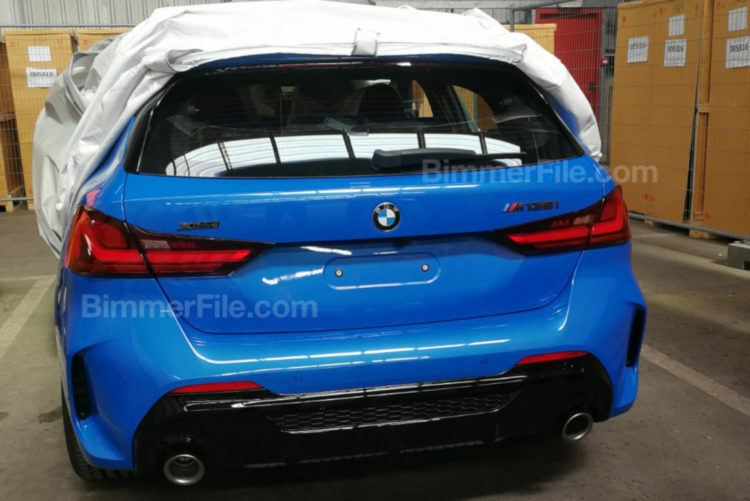 The new BMW 1 Series F40 storms the big stage and does not stick to the schedule: A leak shows the new BMW M135i 2019 completely undisguised! The two photos of BimmerFile.com show practically all details of the front and rear and answer the most important questions about the look of the new compact class from Munich. The color of the now unintentionally unveiled vehicle is likely to be Misanoblau, which we have seen most recently on X2 and Z4 G29. Anyone who has ever wondered how BMW designed the headlights and kidneys now receives the high-resolution answer several weeks before the planned communication start. It should be noted that the kidney is reserved for the M Performance model BMW M135i xDrive and is closely based on the design of the M340i kidney. The usual variants of the BMW 1 Series F40 will most likely have vertical struts, as is the case with the weaker 3 Series models. The photo of the rear not only reveals the rear apron with its large, black diffuser insert, two striking tailpipes and indicated wheel arch ventilation on the side, but also the tail lights of all BMW 1 Series F40s. The narrow-drawn, two-piece taillights emphasize the width of the compact sports car and make the 1 Series with its L-shaped lights clearly visible even at night as BMW. No longer a secret is the drive of the BMW M135i 2019th The provisional top model of the third generation of 1 uses a 306-hp expansion stage of the turbocharged four-cylinder B48 and drives with the help of a Haldex V-clutch all four wheels. The goal of the developers is clear: Despite lower performance, the lap times on the same level as the previous BMW M140i xDrive move.